Over time, production management has become the key factor in productivity and competitiveness for companies in the metal industry, far beyond other factors that have traditionally been very important: use of material, calculation of times and costs, elimination of paper, and acceleration of the information transfer process, etc. An MES (Manufacturing Execution System) is a software system used in production that controls and records the transformation of raw materials into finished products. An MES provides information that helps make decisions on how to optimize production based on the current conditions of a production plant. An MES normally works in real-time and is connected to the rest of the existing management systems and production elements. It allows for the control of multiple elements involved in the production process: requests, personnel, machinery, or support services. This includes the assignment of its location in warehouses, version control, and exchange of information associated with each product with other systems. It provides key information to the plant manager, such as production routes, cutting technology, itemization of materials, or specific characteristics (geometry, material, thickness), all focused on defining how to produce a piece or product. This includes the registration, modification, and analysis of information associated with each resource, either human or material (workplaces, if the material is to be cut or not), aimed at preparing production orders using the most appropriate resources in terms of capacity and availability. Based on this structure, a set of data associated with production is created that, with the appropriate analysis tool, may be processed and made available to the manager or higher-level systems. The production of sheet metal pieces, tubes, or sheet metal profiles is rarely a process that can be planned out in the medium-term. Agility, flexibility, and continuous change are desirable characteristics in a metal production plant environment. Furthermore, in the workshop it is necessary to plan out minute details almost immediately, depending on the situation. Lantek assumes that, in this environment, no one knows how to resolve each situation better than the workshop manager. Therefore, well-organized information is provided to him or her so that timely decisions can be made as quickly as possible, scheduling the work orders that best meet the established requirements and priorities. These systems must be connected to the business management systems so that business-related constraints can be applied to this schedule. This includes the creation and distribution of work to the workplaces. In this step, an appropriate consideration of the concept of nesting, in which pieces from different orders and/or clients can be grouped together, becomes vitally important. Though the actual execution is performed in process control systems (Lantek Wos), the MES system can perform checks on resources and report on the progress of various production processes to other systems. In this case, it is also important to have a view of nesting in addition to the work order or request and have the possibility of making last-minute changes to already-set schedules. This includes the collection, storage, and exchange of process data, the status of the various pieces of equipment, pieces pending/in process/finished, real times, material used, and scrap generated. Lantek has different systems (Lantek Wos, Lantek Workshop Capture, Opentalk) to deal with the different scenarios that may occur in an operating workshop. This includes the creation of data and information from the raw data generated during production processes. For example, it can provide OEE (Overall Equipment Effectiveness) performance indicators or any other pertinent indicator. Recording all of the information related to production makes it possible, both in real-time and once the process ends, to know the status of any element during its processing in addition to the materials and resources used in its manufacture. This makes it possible to regulate quality and traceability when it is necessary to search for the causes of irregularities. An MES system by itself is meaningless in a company today. Integration with other operating systems or company or business management systems is essential for making correct decisions in line with the company’s objectives and strategy. 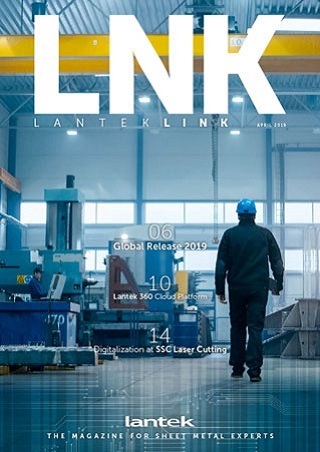 Therefore, Lantek includes various mechanisms for interconnecting ERP/MRP services (Powersync, Avantiaservices) with machines themselves (Opentalk) or even with external CAD/CAM systems. This makes an MES into an open system that cooperates in a dynamic, seamless way for the user along with their environment in the points of the process where it is needed, whether it is definition or validation of production. These mechanisms are possible thanks to the software platform the system is based on, which grants unlimited power of connectivity, even in real-time. A client that wants to implement a management system in a scenario where there are several companies related to sheet metal — but in which all are not centered on cutting pieces — with several production, logistics, and sales centers and that, given their turnover and the financial control involved, needs a financial ERP able to provide analysis in that area and must choose very carefully which software is going to be used in the specific management of their cutting centers. The Lantek MES is in charge of providing the solution as it is integrated with an ERP software with specific intelligence on metal production, extending and supplementing what the ERP generally manages. Lantek Manager is the ideal MES for transforming sheet metal, tubes, or sheet metal profiles because it is a system that is specific to metal. It is modular, scalable, integrated "to the core" with Lantek CAD/CAM software, capable of openly and dynamically collaborating with any system (machine, software) and is accessible from any type of device (web, mobile phone) and from any point.